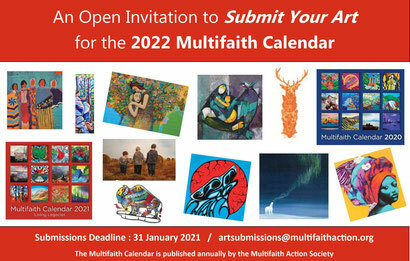 Published annually by the Multifaith Action Society for 33 years, the acclaimed Multifaith Calendar combines comprehensive information relating to world religions, their spiritual traditions and observances with beautiful, community-sourced artwork to create a unique and compelling product with outstanding educational and artistic value. Nearly 500 different holidays and religious festivals from 14 world religions, as well as select cultural, public and United Nations observances, are detailed in the Calendar. By helping to raise awareness of these observances, as well as their historical origins and any spiritual precepts that maybe associated with them, the Multifaith Calendar continues to assist and facilitate cross-cultural understanding, provide a basis for dialogue, discussion and community involvement / engagement, and foster environments of mutual respect, awareness and understanding across communities and in workplaces as well as both private and public institutions across North America and Internationally. Coming Together - Exploring New Directions. The 2019 MFC looks for new paradigms on how to actively engage with each other in ways that hold the promise of inclusion and community and strives to demonstrate both visually and with numerous faith observances and descriptions that there is less that separates us than brings us together. Our 2019 Multifaith Calendar is dedicated to exploring this theme. 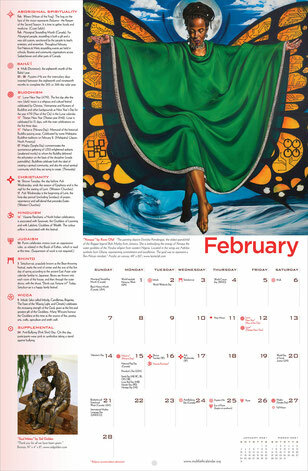 Far from being just an informational resource, the Multifaith Calendar also provides a platform for emerging artists to have their work exhibited in print. Each year, hundreds of artists from around the globe respond to a call for submissions (the overarching artistic theme of the Calendar changes annually), and an in-house selection committee ultimately identifies approximately 30 works for publication. Artists whose work is included are awarded honorariums and given full credit, and in this way the Calendar helps to increase the public exposure, marketability and livelihoods of artists as well. Visit the Multifaith Calendar website to find out how you can get your 2019 Multifaith Calendar today!